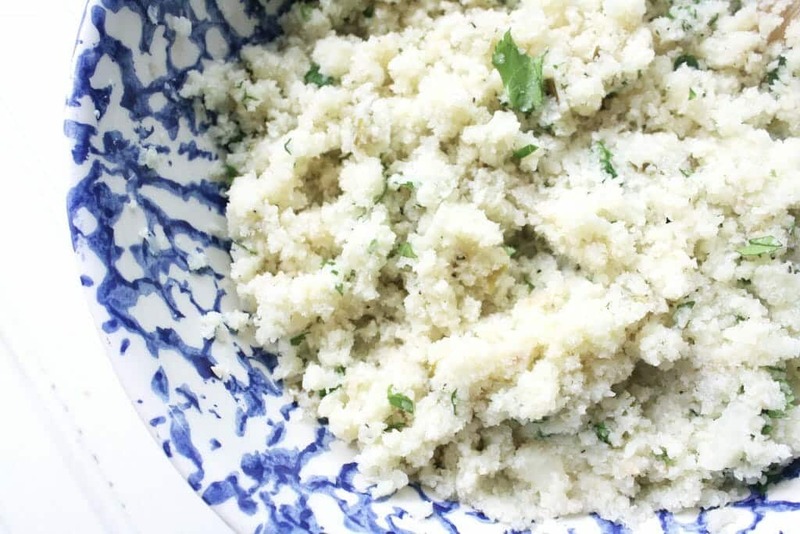 Cauliflower rice is a perfect side dish, especially when you’re looking for something with a little less carbs than traditional rice, but don’t want to sacrifice on taste! 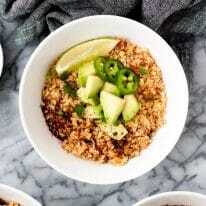 The best part about cauliflower rice is that it can be made a million and one different ways and always tastes delicious! This recipe is one of my absolute favorites as it incorporates bold garlic flavors with light and citrusy (…is that a word?) lime and cilantro. Not a fan of cauliflower? Trust me, when you put this veggie in the food processor, it truly does turn into rice that tastes like grain rice. Plus, cauliflower is high in glucosinolates, which help activate the body’s detoxification system. Additionally, cauliflower is high in potassium, phytochemicals, vitamin C, vitamin K, thiamin, riboflavin, niacin, magnesium, phosphorus, fiber, vitamin B6, pantothenic acid, manganese, and folic acid. According to the CDC, consuming folic acid during pregnancy is essential for helping to prevent neural tube defects in the fetus, such as spina bifida. Cilantro, like many fresh herbs, is often forgotten about when it comes to its health benefits. This herb provides antioxidants, vitamin K, folate, potassium, manganese, choline, beta-carotene, beta-cryptoxanthin, lutein, and zeaxanthin. Lime and other citrus fruits can provide a punch of flavor without any added calories and actually provide a rather substantial amount of health benefits. Lime juice has vitamin C, flavonol glycosides, anti-carcinogenic properties, and liminoids. Liminoids promote the activity of an enzyme in the liver that detoxify a variety of cancer-causing chemicals by deactivating harmful chemicals. 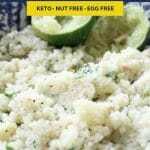 This recipe is keto, low-carb, paleo, Whole30 compliant, gluten-free, grain-free, vegan, vegetarian, dairy-free, and sugar-free! 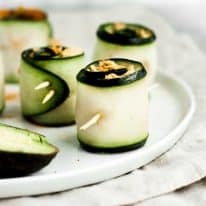 Looking for simple and tasty keto recipes? 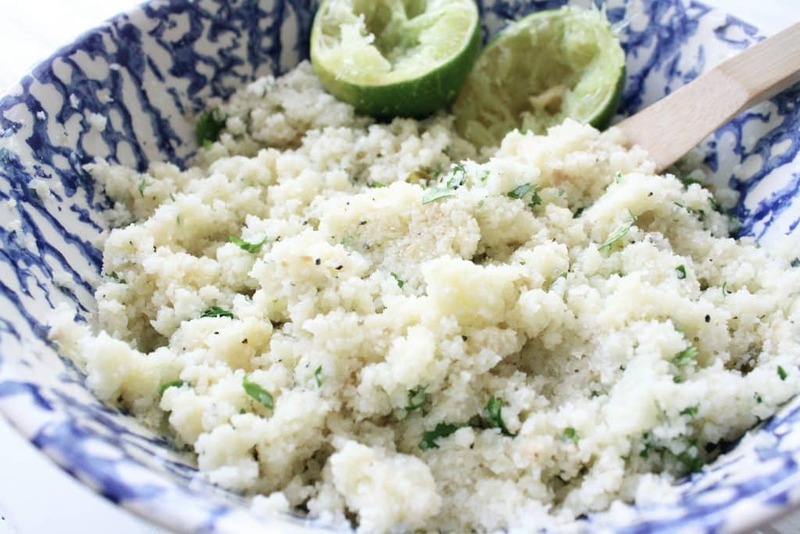 This Cilantro Lime Cauliflower Rice is a nutrient-dense side dish that is low in carbs and packed with flavor! This recipe is keto, low-carb, paleo, Whole30 compliant, gluten-free, grain-free, vegan, vegetarian, dairy-free, sugar-free, and contains only 4.1 grams of net carbs per serving! Wash cauliflower, cut into florets, and place on paper towel until dried. Place raw cauliflower florets in food processor and blend until coarsely chopped. In a large saute pan over medium flame, heat olive oil, garlic, and green onions until fragrant. Add chopped cauliflower to pan and stir frequently. Cook cauliflower until soft and somewhat browned (this adds a level of delicious crispiness!). Remove from heat and, in a separate bowl, gently stir in lime juice and cilantro.